Floors2Love Flooring franchise business opportunity. Free Floors2Love Flooring business franchise information. Floors2Love is the natural progression for the original company, FlorLine Midwest. Florline Midwest was founded over 20 years ago to serve major corporations needing high quality, lifetime flooring systems. FlorLine's coating and topping systems are more durable than concrete, yet more flexible and require no maintenance. 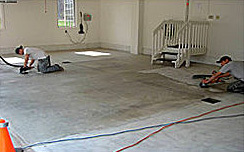 As FlorLine prospered, they would periodically install residential flooring systems for their clients. The residential demand continued to grow, leading to the launch of an entirely new income stream with immediate cash flow: Floors2Love. Consider the millions of garages, patios, driveways, basements, kitchens, and bathrooms in homes across the country. Floors2Love can resurface all of them with one of our exclusive Liquid Solid floor systems. Floors2Love may not be registered in your state. Please contact us for more information. Floors2Love is not registered in CA, NJ or WI. To learn more about the Floors2Love Flooring franchise opportunity, simply complete the form below.